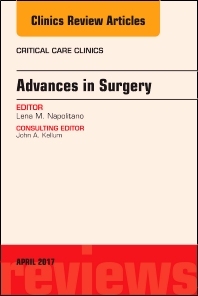 Guest editor Lena Napolitano has assembled and expert team of authors on the topic of Surgery in the ICU. Articles will focus on: Oxygen Support and Mechanical Ventilation Advances; Ventilator-associated Pneumonia – New Definitions;Optimal Strategies for Severe ARDS; Persistent Inflammation/Immunosuppression Syndrome; ABCDE Bundle in Critical Care;Renal Replacement Therapy in Acute Kidney Injury: Consensus? ; Transfusion Advances in Critical Care; Severe Sepsis and Septic Shock: ProCESS; ARISE: PROMISE – What is Optimal Resuscitation? ; Nutritional Support in Critical Care: What is the Evidence? ; Acute Kidney Injury and Outcomes; and Tracheostomy Update: When and How?